REPORT FROM SENATE MAJORITY – HONOLULU, HAWAII—His Excellency Oscar Manutahi Temaru, President of French Polynesia, wrapped up his week-long Hawai‘i visit on January 13, 2012. President Temaru and his four-member delegation were here to explore economic opportunities between Tahiti and Hawai‘i. President Temaru was accompanied by his Minister of Marine Resources Temauri Foster, Minister of Agriculture and Farming Kalani Teixeira, and Advisors Hiria Ottino and Teua Temaru. “His Excellency Oscar Manutahi Temaru and his delegation have a deep connection to Hawai‘i through our Polynesian ancestors and they are looking to our State as a model to modernizing French Polynesia,” said Senator J. Kalani English, chair of the Senate Committee on Transportation and International Affairs. During their visit, President Temaru and his delegation looked at ways to create business ventures between Tahiti and Hawai‘i as well as learn about Hawai‘i’s infrastructure and industries. For insight on how to boost Tahiti’s economy, President Temaru and his delegation met with several heads in the tourism and trade industries. 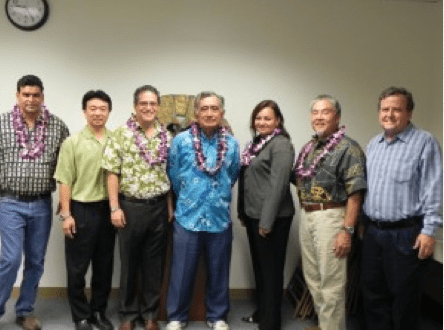 They met with Hawaiian Airlines, the Department of Business, Economic, Development and Tourism (DBEDT); the Hawai‘i Convention Center, Hawai‘i Tourism Authority and Matson Navigation Company. President Temaru and his delegation looked into the agriculture industry and sustainability initiatives by meeting with leaders at the Department of Agriculture; Maui Invasive Species Committee; University of Hawai‘i-Maui, Sustainable Living Institute; University of Hawai‘i –Manoa, College of Tropical Agriculture and Human Resources; the National Tropical Botanical Gardens’ breadfruit project and the Maui Arts & Cultural Center’s photovoltaic system. To explore ways to improve safety and disaster management in Tahiti, President Temaru and his delegation visited the Asia-Pacific Center for Security Studies and Pacific Disaster Center. The group also met with several State officials including Governor Neil Abercrombie, Senate President Shan Tsutsui, as well as other senators.